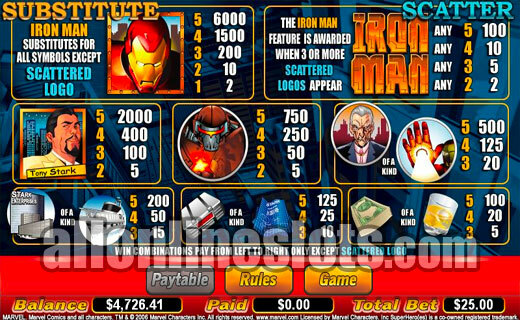 Iron Man is a Cryptologic slot which is part of the Marvel Jackpots range. Top jackpot on the reels is 5,000 coins and max bet is 25 coins per game. The pick a box bonus offers another way to win with each pick paying up to 250X your bet. 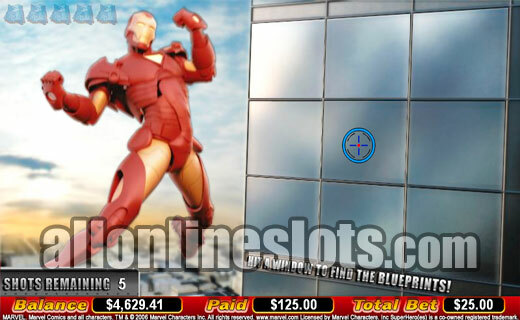 Iron man is a 5 reel, 25 pay line video slot machine released as part of the Marvel Jackpots line of games found at Cryptologic casinos. It has a second screen bonus games as well as a link to the three level Marvel Jackpots system. As the name suggests Ironman is the star of this game. Marvel Comics first introduced Iron man way back in 1963. His alter ego Tony Stark is the owner of Stark Enterprises. Unlike many of the Marvel characters Ironman has no special physical powers. Instead his armored suit gives him the ability to do superhuman things. On the reels of Ironman all of the symbols are related to Stark Enterprises. The Ironman symbol is wild and substitutes for everything but the scattered logos. Lining up five wild Ironman symbols pays the top jackpot of 6,000 coins. Second highest pay is 2000 coins for five Tony Stark symbols. The actual amount you will win depends on the coin size you choose to play in. Coin sizes start at 1 cent and go up to $5. This means the top jackpot can pay anywhere from $600 to $30,000. It is worth noting that the bigger you bet the more likely you are to hit one of the random Marvel Jackpots. The scattered Ironman logos activate the second screen bonus game. Hit three, four or five anywhere on the reels and you move on to the bonus. Here you get a great animated sequence of Ironman hovering outside a building. You get to pick 5 or the 9 windows in search of blueprints (Screenshot). If you find a blueprint you can win up to 250 times your triggering bet or 6250 coins - just slightly higher than the jackpot on the reels. If you select a window that does not reveal a blueprint you still win a consolation prize. After you have made your five picks the wins are added and the bonus ends. 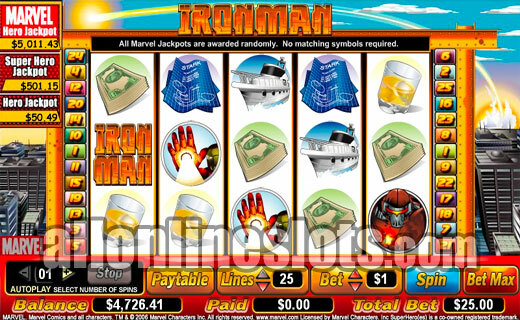 Iron man is sure to be a popular pick in the Marvel Jackpots range. With a 2008, Iron man movie being released it will likely get a boost up the rankings. If you are a fan of this popular Marvel character then you will love this game. If not it is still well worth a look.